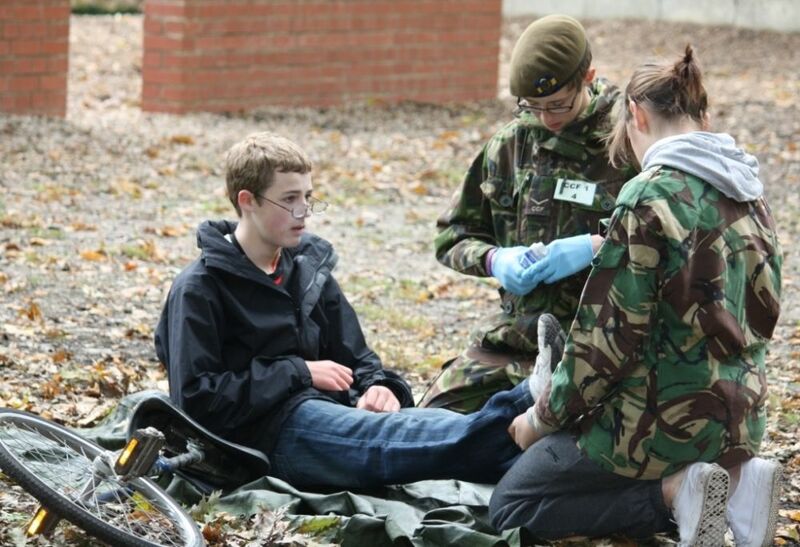 Uniformed young people from across all the cadet forces including St John cadets assembled over the weekend (13 & 14 Oct) in the prestigious surroundings of the Royal Military Academy Sandhurst to demonstrate practical first aid skills in the cadet forces national and inter services competitions. Army cadets, air cadets, sea cadets and St John cadets tackled a range of demanding and realistic scenarios both as individuals and as teams. 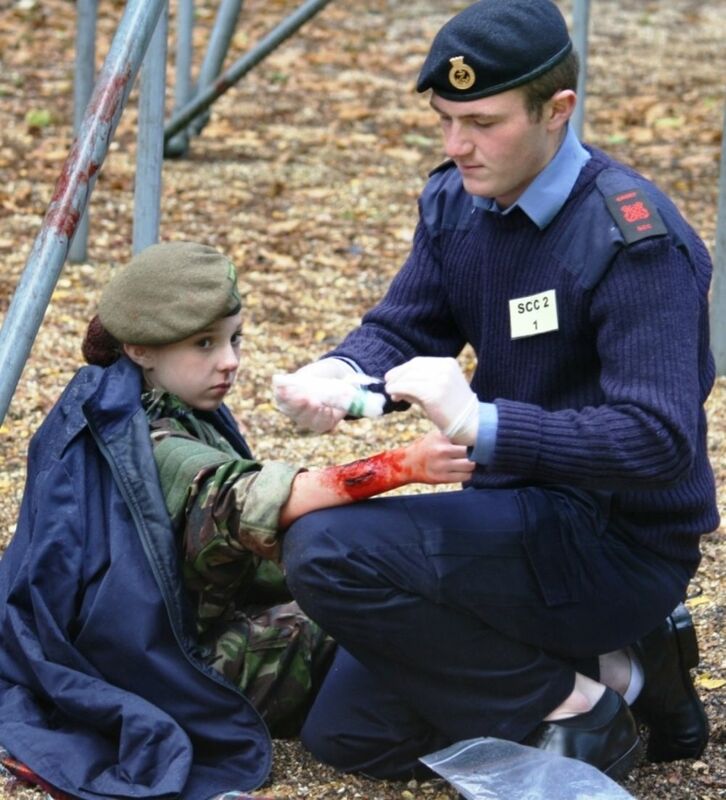 The UK's largest first aid competition for young people saw 36 teams each of four cadets aged 13-17 and twelve teams of young adults under the age of 24 entered in four separate national competitions and a special event for St John cadets. Twelve scenarios, all but one outside, tested the cadets with realistic emergencies aided by dramatic casualty make-up. The ACF team test setting was a post office robbery in which one of the post office staff was injured by a shotgun blast and another clubbed with the shotgun. 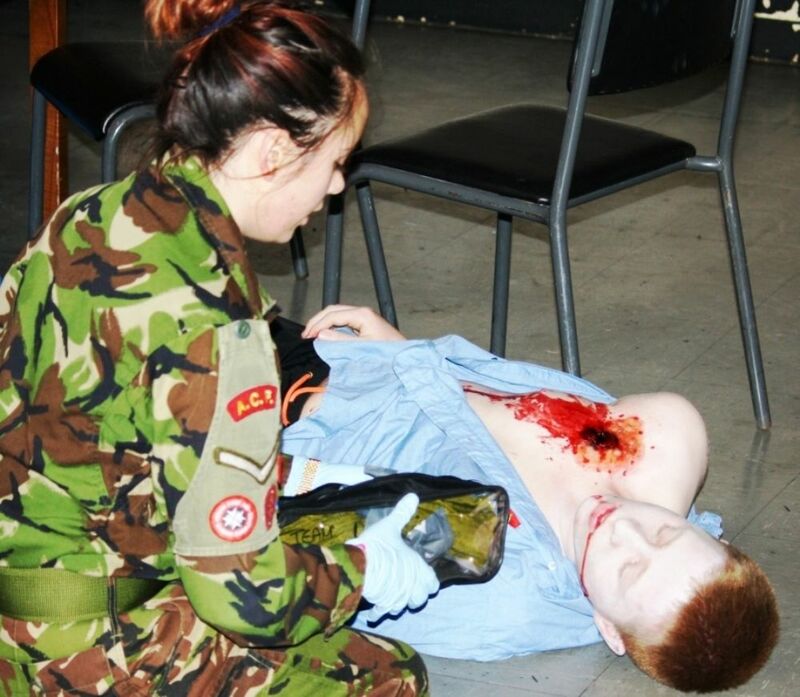 Other scenarios included an expedition setting in which a cadet suffered an allergic reaction; a fight scene; a casualty who collapses and stops breathing. Simpler individual tests included a firework accident and a dog bite. Winners of the St John Cadet trophy were Hertfordshire. 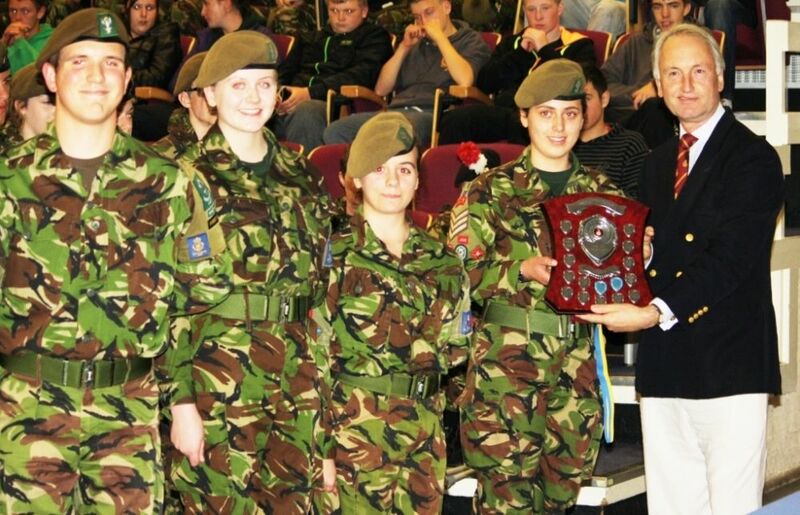 Highest scoring cadet on Saturday was Cpl Gail Scott of Dollar Academy. The winning and runner up teams from the national competitions returned on Sunday 14th Oct, joined by the winners of the Air Training Corps national events, young adults from the Combined Cadet Force and for the first time by a guest team from St John cadets to compete against each other in the Inter Services Championships. Cadets had to tackle a range of injuries caused by a collision between two unicycles and were also marked by how effectively they reported to a first responder. The young adult team test involved three cadets falling from a tree as they climbed out on a long branch. Unusually all the individual tests challenged each competitor to deal with two casualties at the same time. Scenarios included a youth who had been drinking falling on top of another youth and sustaining a spinal injury; an apprentice who sliced off two fingers with a circular saw; a fractured arm with the bone penetrating through the skin and an asthma attack. Over both days all competitors also completed a test that required them to resuscitate a collapsed casualty including the use of an automated external defibrillator. The test required them to work together, change over every few minutes and then report to a first responder. More than 150 cadets went away from the weekend fully confident to use the AED in real life emergencies. 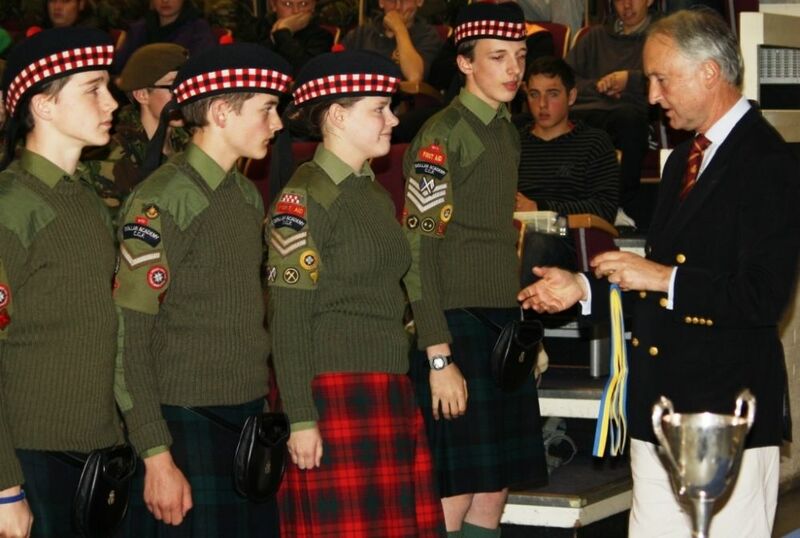 Lieutenant General Louis Lillywhite, former Surgeon General of the armed forces and currently the Chief Medical Officer of St John Ambulance, the presented the Inter Services trophies.